The Cinderella story is pretty much an archetype – variations on the theme of the innocent, warm-hearted young lass who finds herself in awful conditions through no fault of her own, before finally finding good fortune and true love go back many centuries, with that scribbler of old fairy tales Charles Perrault in the late 1690s and the Grimms in the early 1800s crystalising the story into the form we’re familiar with today. 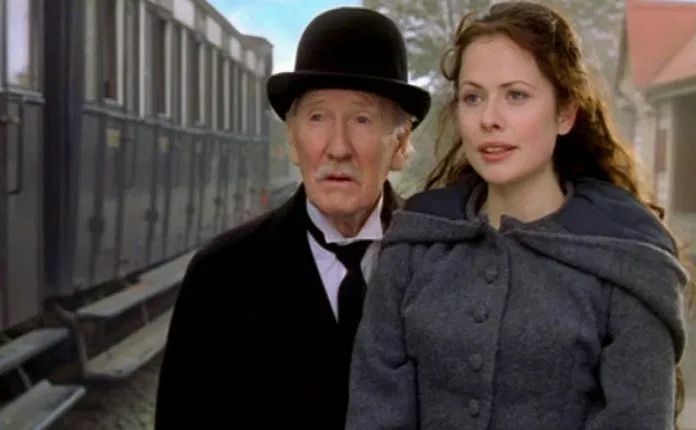 This version is a television film from 2000, which aired on Channel 4, and boasts some solid British thesps like David Warner, Leslie Phillips and the late (and much-missed) Katrin Cartlidge, joined by Kathleen Turner (Romancing the Stone, Body Heat). With such a well-known story there is always a question of why do another version? In this case it’s easily answered – because the film-makers have reworked it to be more relevant to the modern day, and in a manner that the younger viewers can enjoy, but which works well for the teen/YA and the adult audience. It is set in a sort of fantasy kingdom of strangely coloured skies, which has the traditional horse drawn carriages, palaces and country mansions, but also open topped cars and steam trains, royal orchestras but also a guitar playing, singing Prince. The Prince and his friends come across as a playful pastiche of the modern, hipper young Royals, the wicked stepmother (Turner) and her nasty daughters aren’t just nasty and spiteful to poor Cinders, they are also a nice comment on modern, super-shallow celeb culture, creatures who are empty inside but made-up exquisitely for outward appearance, the sort who appear in the pages of Hello and its ilk. David Warner’s father returns from a business trip with a “surprise” – a new wife and step-daughters, to the shock of his daughter. Her shock is furthered by the way her new stepmother so obviously manipulates her widowed father and allows his new stepdaughters to bully her. This swiftly escalates from subtle manipulation to the far more obvious kind of control – Turner’s wicked stepmother is soon quite clear she is in this for money and the noble connections. Warner’s father has the noble title but not much money, so he is soon banished to sleep in the attic – “You know the rule: cash equals company.” despite this he still refuses to see what is going on (no fool like an old fool), and his daughter becomes increasingly isolated in what was once her own loving home. Cinderella retreats to the grave of her beloved mother on the hills, encountering a bird of prey who, in the best animal tradition in fairy tales, acts as a form of guide, leading her to a cave by the lake, a magical cave where the waterfall parts for her. Instead of a fairy godmother, here we have Mab (Jane Birkin), an odd being who is half-amused, half-offended when Cinders asks if she is a witch. She may not be a witch, but she does seem to have some magical abilities, and she helps Cinderella in her own peculiar way. I somehow missed this when it was first aired, and I’m very glad I got a chance to see it now. While some of the effects are very early 2000s (not bad, just not as polished as you would expect today), that in fact adds to the charm here, giving the kingdom an other-worldly look that suits it quite well. And besides, it’s the story and characters which really matter here, and oh boy does Kathleen Turner clearly enjoy playing the wicked stepmother, in fact she seems to relish it, and she is delectably wicked here and, pardon the pun, having a ball with the role (as are Lucy Punch and Katrin Cartlidge as her nasty daughters). This is an unusual, modern take on an old tale, played well, with some nice riffs on both popular culture and society (Turner inspecting her wicked daughters’ vast shoe collection and advising them “Remember the harder they are to walk in, the more effective”), while also tipping a knowing hat to the old folkloric tropes (“I hate happy endings”). 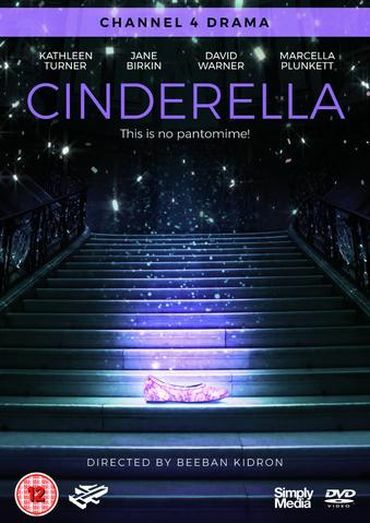 This is a clever version of the Cinderella tale, with all the main beats given a nice, more contemporary twist (and yet still classic tropes), and it knows enough to have fun with it along the way, and take the viewer along too, with a big smile.